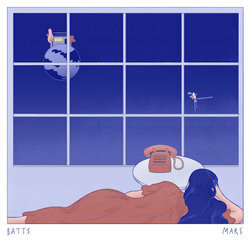 Earlier this year, BATTS signed to THAA Records and released her debut EP '62 Moons'. 2018 has also seen BATTS selling out her EP Launch at the Northcote Social Club, taking the ‘Gun’ single tour up the East Coast, supporting Didirri on his National tour of Australia, and also complete her first International tour performing at a Communion Presents show in London, and supporting Cub Sport on their UK tour. In her short career so far, BATTS has gained International radio support from the likes of triple j (Australia), BBC Radio 1 and Radio X (U.K), and also KCRW (USA). After recently playing an incredible set amidst torrential downpour at Hills City festival in Melbourne, BATTS stepped out on tour in support of her single ‘Gun’; the first track from her forthcoming debut concept album ‘The Grand Tour’, slated for release in 2019. Since returning from the road, BATTS has been hard at work finishing up the record; a release that will take listeners on a journey to outer space, inspired by the infamous Voyager 1 mission.